Vancouver – Numeris, the radio and television ratings people, released the “Fall Book”, The Autumn 2018 Radio Ratings. These are the numbers that help advertisers decide which station to advertise with, and for programmers, an insight into what if any tinkering needs to be done to their formats. Fraser Valley Radio Ratings came out last week, click here. Of note, CBC (CBU-AM and CBU-FM) show up in ratings. The two CBC French stations, Pulse FM in Surrey and all the multilingual stations do not subscribe to the ratings service. CBC aside, CKNW is the #1 Information station (commercial). 103.5 QM-FM is the #1 Music station (commercial). Virgin continues to beat Z95 for the best in Top 40. CFOX dominates The Peak in Album Rock. With Classic Hits, LG104.3 eclipses the once mighty JACK FM. CKKS KiSS FM,while licensed as a Chilliwack/Vancouver spill station, shows Vancouver numbers here. Both All Sports stations, Sportsnet 650 and TSN 1040 along with All Business Bloomberg 1410 and All Traffic AM 730, hold down the bottom spots. CIRH Roundhouse Radio have no ratings as they are in an ownership change and off the air. 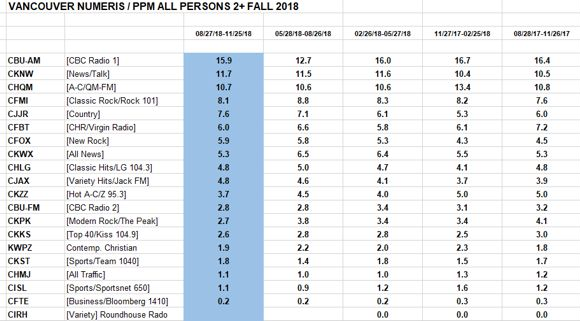 Be the first to comment on "Vancouver Radio Ratings – Fall 2018"